Any regular reader of mine knows that I seldom agree with liberal orthodoxy. For the most part, I just shake my head at the silliness of their dogma. Most of it is too inane to get worked up about. However, there’s one thing they do that really makes my blood boil. While only one of their many hypocrisies, liberal policies on education are not only wrong-headed, they are immoral. They are designed with the intent of keeping poor (often minority) children in poverty, with little hope to reach the American Dream. And, they are so designed because they have to be to satisfy the union machine that feeds the democrat party. It’s a simple equation. They sell the future of poor young people for campaign dollars. Seriously, I do not understand how any liberal who supports the party line on education can sleep at night, knowing what they are doing to these poor children. Study after study shows that a good education is the best way to escape the awful cycle of poverty. And, yet, liberals continue to deny this fundamental need to so many inner city children. Nowhere is this playing out more publicly than New York. And, there’s no greater hero than Eva Moskowitz (herself a democrat). And, there’s no greater evil than newly elected New York Mayor Bill de Blasio. Moskowitz is New York’s educational-reform champion and runs the largest system of charter schools in New York (6,700 students at 22 schools). Do charter schools work? Brace yourself for these numbers. Moskowitz’s Success Academy students, which come overwhelmingly from poor, minority families, scored in the top 1% in math and top 7% in English on the most recent state tests. Like the recent Super Bowl, it ain’t even close. Despite this undisputed success, the new Mayor campaigned on a promise to stop her and, upon taking office, is doing everything he can to stop the growth of the Success Academy and dismantle the existing schools. I don’t use the word “Evil” lightly because it intones intent that reflects deeply on a person’s soul and their on their character. But, I have no trouble calling a man Evil who builds his political agenda around harming children, especially those children who come from the least advantage and need the most help. That’s pure, unfiltered Evil, with a capital E. Shame on you Bill de Blasio. Shame on you liberals who voted for him. This is a GREAT topic, so thanks for blogging about it. I’m always fascinated to read your take on things (for real). Education is such a complicated topic, and I think it twists the usual liberal/conservative dispute into all kinds of interesting knots. I think you are probably right that many politicians owe much of their positions to pressure from groups that supported them. It is pretty obvious that the unions in New York City, teachers or otherwise, would support the Democratic candidate, given the politics of that metropolis. Of course, de Blasio won by a hefty margin, so he may feel less beholden to any one particular part of his constituency. I think it’s quite easy to blame the teachers’ union for all evils in the world of schools, since I see it done all the time. Not sure in this case quite how much they are to blame. Be that as it may, there are so many interesting ways to look at how we educate our kids. For instance, according to the research I did after reading your blog (inspired by you, Mr. Data! ), just over 6000 kids in NYC go to charter schools. Some of these schools are amazing, some are terrible. But that’s a small number of kids compared to the whole population. And the charter schools are either quite expensive to run (much more than public schools), or are housed in public schools and so are being basically supported by their host – a host who often can’t afford that cost. So, if you are a populist like de Blasio, you might think, “The charter schools are good, but what we really need to do is fix the larger public school system for the greater good of all poor children (and non-poor children, too).” The question is, is that a noble goal? You and I manage to disagree on practically every topic out there, but we can totally agree on education. We want our children and other people’s children to be educated well. I’m going to assume that the new mayor also cares about children, and has good motives for what he is doing. I will also assume that Republicans wanting vouchers have good motives, even if I disagree with their ideas. Meanwhile, because I am reading in your post that you have a good deal of passion on the subject of education, I am curious to hear more about your views. I bet we might even agree on some of them. Dan, where have you been??? I’ve missed my counterweight on the political blogs for ages now. Welcome back! I’m glad to see we agree on the need to educate children. If we didn’t I think humankind would be even more f*&ked than it already is. However, I respectfully disagree that Mr. de Blasio has children’s best interests at heart. There’s such a tremendous divide between that belief and his behavior that I could never resolve it. In fact, I keeping the underclasses in their place is a key requirement for the democrat party. If we ever actually rid ourselves of poverty and inequality, all the liberal talk tracks would disappear. So, keep the nanny state in play is paramount to the existence of the democrat party. 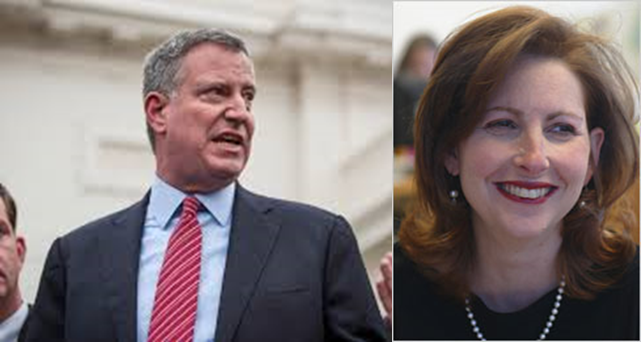 So, when a guy like de Blasio sees a program like Moskowitz’s being successful, he has to stop it. Otherwise, his very existence as a politician is threatened. As an aside, I think you need to your numbers again. Across the nation, the per student cost of educating a kid in charter schools is generally about half what it is in public schools. NY city public schools spend $19,076 PER STUDENT. By contrast, charter schools in NY spend about $16,600. And, to your point on housing them in the public schools: (a) there’s currently overcapacity in public school space and (b) more importantly, public schools operate rent free as well. The taxpayers own their buildings too. This sounds like a complicated topic. If we want to support charter schools (I frankly have NO idea where I stand on this), it sounds like – if you are right about there being available space in public schools – they should be housed within existing schools. Sounds like this is something of a personal issue for de Blasio. Again, not living in NYC, I don’t know anything about the guy. If he rose up in big city politics, there’s a fair chance he’s a bully and has a history of complex relationships behind him. As a supporter of teachers’ unions myself, I can understand his position. BTW, I support teachers’ unions because teachers are underpaid and work their asses off at the most noble profession I can imagine. Without unions, they would be paid even less. The unions are FAR from perfect, but they have to push where they can. If you can’t get salary, you push for job security. It’s a crappy system all around. If our society treated teachers the way they should be treated, none of them would join the union. Please also note that Eva Moskowitz’s schools are supported by venture capitalists, and therefore have lots of money behind them, unlike public schools. “I simply wouldn’t favor charters the way Mayor Bloomberg did because, in the end, our city rises or falls on our traditional public schools,” quoth the mayor. This is the meat of the matter. Do you radically improve schools for a small percentage of children, or do you do the best you can for all? I guess each mayor will answer this question for herself, but there is not one answer that is moral and another that isn’t. As for your notion that the “democrat party” (love the appellation!) wants to keep the underclasses in their place because without subjugated underclasses the party would have no constituency, I find that a remarkable idea. Basically, the implication is that any party that supports anything actually doesn’t really want that thing to happen because the party will otherwise lose its motivating principle. Is it not possible for me to support greater equality in a genuine way (if it is achieved, I have then lost because my issue has gone away)? This seems an argument against any politician’s being able to ever hold any sincere belief. Which may be the case. But such cynicism doesn’t seem like something you would embrace. Sorry for slow reply here. Just a couple of clarifications. 1. NYC public schools also get free rent. So, not charging rent to charters doesn’t give them any advantage. It just puts them on equal footing. 2. Eva Moskowitz’s schools are not supported by venture capitalists. Her org is, I’m almost certain, a 501(c)3, which survives on charitable donations. There are certainly other charter systems that are for profit. That’s fine with me. As long as the kids get a good education, I’m fine with someone making a profit, especially when the overall cost per student is always less than public schools in the same jurisdiction. 3. Of course I support improved schools for all kids. But, I think we now have enough data that, until the unions are moved aside, it will never happen. Places like NY and DC have been throwing more money at the problem for decades, to no avail. 4. By what metric are teachers underpaid, esp public school teachers? They work 9 months a year and often make about $100K? Sounds like an OK job to me.